DryerFlex is constructed with all aluminum ribbon and fire-rated, is as flexible as "slinky" foil flex, yet stronger than semi-rigid aluminum. With all that being said, a great feature is the ability to retain its shape. Just like an elephant, DryerFlex doesn't forget. Also like an elephant, the DryerFlex is tough. A major issue in laundry rooms is what's known as the crush point. The vibration of Dryers causes them to, over time, slide back towards the wall. 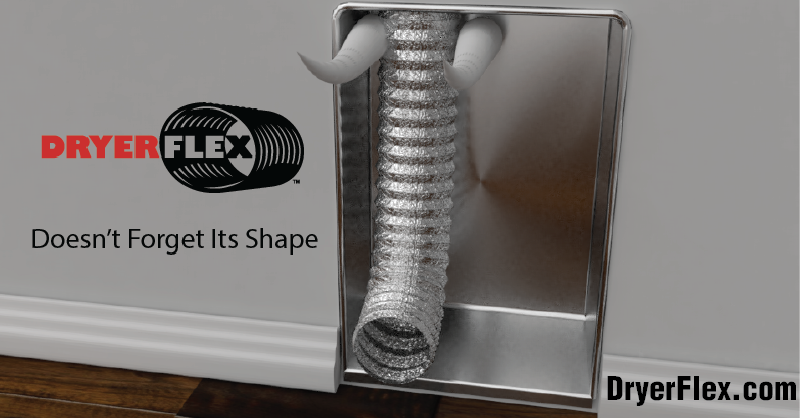 A transition hose that's not built strong (like every duct that was previously available before DryerFlex) can restrict airflow by easily crushing and actually increase the rate of lint accumulation. This causes drying time to be longer, increasing your electric bill and creating a fire hazard. Use the locator to find an installer and have them install DryerFlex today!